InselAir is planning more rapid expansion as the Curacao-based airline group adds six aircraft over the next two months for a total of 17. The additional capacity will mainly be used to expand the group’s new Aruba base, where InselAir has five routes, but further expansion in Curacao is also planned. The group’s network will soon reach 20 destinations following the recent and upcoming launch of services to Georgetown in Guyana, Barranquilla in Colombia and Punta Cana in the Dominican Republic. Several more destinations are being eyed for 2H2014 which would extend the network to Brazil, Cuba and Ecuador. The expansion follows growth of over 20% in 2013, when the group focused on growing existing routes from Curacao in response to opportunities created as local competitors cut capacity and exited. Traffic will likely again grow at least another 20% in 2014. InselAir was established in Curacao in 2006 and has steadily expanded over the past eight years. The privately-owned carrier transported 1.15 million passengers in 2013 across a network of 16 destinations. Passenger traffic was up 23% compared to 2012 while revenues increased by 27% to ANG280 million or about USD156 million (see background information). InselAir currently operates 18 routes from Curacao with a fleet of four MD-80 series aircraft, three Fokker 50s and two Embraer EMB-110s. The carrier’s 20th destination overall (Punta Cana) will be launched on 7-Jul-2014. In late 2013 InselAir launched a subsidiary in Aruba, which currently operates a fleet of two MD-80s on five routes. All of InselAir Aruba’s current destinations are also served by its sister carrier from Curacao except Georgetown, which is only served from Aruba with connections available from Curacao. The InselAir Group established InselAir Aruba in 2011 and initially hoped to launch the carrier in early 2012. But the project faced repeated regulatory delays and setbacks. InselAir Aruba finally commenced operations in Dec-2013 with flights to Caracas in Venezuela and Curacao. In Apr-2014 InselAir Aruba added flights to Miami and Valencia in Venezuela while service from Aruba to Georgetown in Guyana began on 18-Jun-2014. 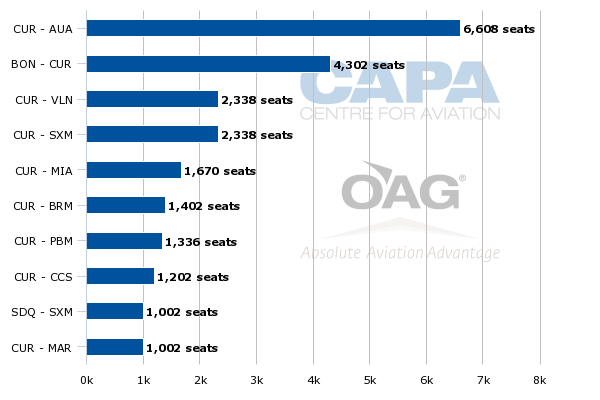 According to OAG data, Miami is currently served with five weekly flights (up from four when it was launched) while Caracas, Georgetown and Valencia are each served with two weekly flights. Aruba-Curacao is served with three weekly flights but this is supplemented by 38 weekly frequencies from its larger sister carrier. Aruba has traditionally been InselAir’s largest destination from its Curacao hub. 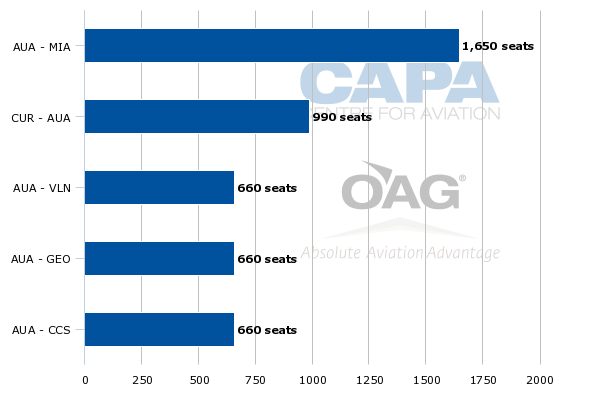 Aruba currently accounts for about one quarter of the Curacao-based carrier’s total seat capacity. Bonaire, which is the third island in the ABC group, is InselAir’s second largest destination and is currently served with 36 weekly flights. The ABC islands are all part of the Netherlands (but not the EU), with Aruba and Curacao self-governing while much smaller Bonaire is a Dutch special municipality. Saint Maarten, Miami and Valencia in Venezuela are InselAir’s other top five routes from its Curacao hub. Saint Maarten is one of six islands that make up the Dutch Antilles but is not part of the ABC grouping. InselAir has a mini-hub at Saint Maarten with links to Port au Prince in Haiti and Santo Domingo in the Dominican Republic as well as Curacao. The group aims to eventually establish a subsidiary in Saint Maarten. Barranquilla is the Curacao-based carrier’s most recent new destination and was launched on 20-Jun-2014 with two weekly Fokker 50 flights. Barranquilla became InselAir’s second destination in Colombia after Medellin. A second destination in the Dominican Republic, Punta Cana/La Romana, will be launched on 7-Jul-2014 with initially one weekly flight from Curacao. Barranquilla and Punta Cana mark the first new destinations for the Curacao-based carrier since 2012. InselAir CEO Albert Kluyver told CAPA on the sidelines of the 2-Jun-2014 IATA annual general meeting that the carrier focused in 2013 on expanding existing routes to fill the voids left by Dutch Antilles Express and Tiara Air. Curacao-based Dutch Antilles Express (DAE) was declared bankrupt and suspended operations in Aug-2013. According to OAG data Dutch Antilles Express previously competed with InselAir on 10 of its Curacao routes: Aruba, Bonaire, Caracas, Maracaibo, Miami, Paramaribo, Port au Prince, Saint Maarten, Santo Domingo and Valencia. InselAir is now the only carrier with non-stop services from Curacao to Aruba, Bonaire, Maracaibo, Paramaribo, Port au Prince, Santo Domingo and Valencia and is the only carrier with direct services to Port au Prince (Port au Prince is currently served with a stop in Saint Maarten). Aruba-based Tiara Air has significantly downsized over the past year and had its air operators’ certificate withdrawn in early 2014. While Tiara still seems to be competing in some short-haul markets using small turboprops from other operators it has pulled out of several key InselAir routes including Aruba-Caracas and Aruba-Curacao. Tiara’s main base is Aruba but it traditionally had competed against DAE and InselAir as all three carriers catered to the broader ABC market, with Tiara mainly offering connections for Bonaire and Curacao passengers via Aruba while DAE and InselAir traditionally have offered connections for passengers via Curacao. The demise of DAE and cutbacks at Tiara has left InselAir as the dominant carrier in the Dutch Caribbean. InselAir claims it now has about a 40% share of traffic in the Dutch Caribbean. 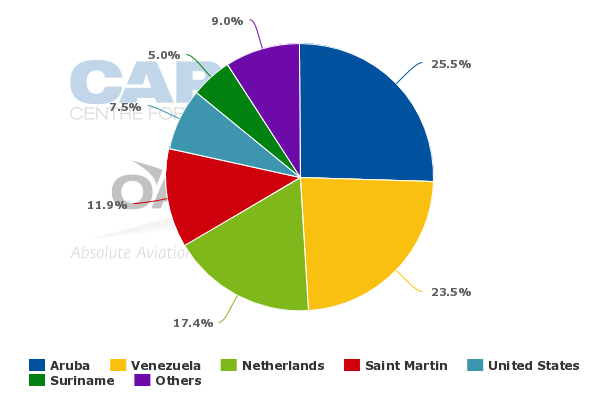 Within the Dutch Caribbean InselAir now has a near monopoly as it claims it currently has a 100% share of the market between Curacao and Aruba, 100% between Curacao and Saint Maarten and 90% between Curacao and Bonaire. InselAir has long been interested in opening a hub in Aruba as it is a bigger local market than Curacao. Aruba also has the added benefit of a US pre-clearance immigration facility, which eases connections to the US. InselAir had been planning to focus expansion on Aruba in 2013 but this did not end up occurring due to a combination of repeated delays in launching InselAir Aruba and opportunities in Curacao due to the exit of DAE. But InselAir is now planning to turn its attention to Aruba in 2014. Mr Kluyver says InselAir Aruba will place into service over the next few weeks three Fokker 70 jets which the group has acquired from KLM. InselAir plans to use the new Aruba hub to extend the group’s network to Brazil, Cuba, Ecuador and Puerto Rico. Havana in Cuba and San Juan in Puerto are expected to be added while in Brazil the group has been looking for some time at Manaus and Belem. In Ecuador, InselAir has been preparing for some time to serve Quito. Additional destinations in Colombia are also planned. (The group does not yet service Colombia’s capital and largest city, Bogota). Most of the new routes from Aruba will be launched with Fokker 70 regional jets. The Fokker 70 is seen as the ideal aircraft for the new routes from Aruba into South America as the distances generally require a jet but the routes are generally too thin for the MD-80. Aruba is also seen as the ideal hub for the new routes as there is more local demand compared to Curacao, which will still be connected via the air bridge between the two islands. The group also plans to take delivery in Jul-2014 of two additional Fokker 50s, also acquired from KLM, and one additional MD-80. Mr Kluyver says the additional Fokker 50s will be based in Curacao and be used mainly to expand intra-island services. The additional MD-80 will also be based in Curacao, which has seen its MD-80 fleet shrink as aircraft have been transferred to InselAir Aruba. InselAir has already quietly become the fourth largest Caribbean airline group. The group currently has about 31,000 weekly seats, putting it only behind market leader Caribbean Airlines (which took over Air Jamaica in 2011), LIAT (a regional carrier focusing on the intra-island market and owned by several Caribbean governments) and Bahamas Air. As InselAir further expands in 2H2014, with several new routes likely from Aruba and additional capacity from Curacao, the group could overtake both Bahamas Air and LIAT to become the second largest Caribbean player. InselAir also has been consistently profitable while most Caribbean airlines have remained in the red. InselAir has even been able to work around the currency challenges in Venezuela which particularly impacted its biggest rivals, DAE and Tiara. Venezuela is an important market for InselAir, accounting for about 25% of the group’s capacity. But Mr Kluyver says InselAir was recently able to conclude a deal with the Venezuelan government which will allow the group to receive from the Venezuelan government the funds held based on its ticket sales in Venezuela from 2013. IATA has estimated the Venezuelan government owes foreign carriers serving the country about USD4 billion. Several carriers such as Alitalia and Air Canada have dropped services to Venezuela while others such as Panama’s Copa have cut back significantly in order to reduce exposure to Venezuela. Most recently American announced plans to cut its capacity to Venezuela by almost 80% until the issue over currency controls can be resolved. A potential competitive advantage arises as InselAir is one of only a few airlines (all from the Caribbean or Latin American) which have come to an agreement with the Venezuelan government. The group does not see Venezuela’s currency controls as a threat or potential future stumbling block to its planned expansion, as it is confident it will always eventually get the money from tickets sold in Venezuela. As other carriers cut capacity to Venezuela, InselAir is likely to grow its share of the Venezuela-US market. Flights from Miami to Curacao are timed to connect with flights from Curacao to Caracas and Valencia. The group’s new Miami-Aruba service also connects with Aruba-Caracas and Aruba-Valencia. The Miami-Venezuela market has been an important niche for InselAir as well as other Caribbean carriers. Overall transit traffic is an integral part of InselAir’s business as the local ABC market is relatively limited. InselAir says its Curacao hub now handles about 300,000 transit passengers per year. Suriname and now Guyana are also only viable because of the connections to Miami. InselAir is also increasingly targeting South America to Caribbean connections. While South America-North America is a much bigger market, South America-Caribbean is a growing market that is relatively under-served. The ABC islands are ideally located for South America-Caribbean traffic as they are the closest Caribbean region to South America. InselAir estimates it has an 11% share of the South America-Caribbean market, making it the largest carrier in this market after Panama-based Copa. Connections within the Caribbean also have grown in importance as the group adds more regional destinations such as Punta Cana. InselAir estimates that it also now has an 11% share of the intra-Caribbean market, making it the third largest player after American and LIAT. InselAir has expanded rapidly since its 2006 launch and has grown during a period in which several Caribbean carriers have shrunk in size, been bought out by bigger airlines or exited the market entirely. The group is now the largest carrier in the Dutch Antilles and is one of the leading carriers in the entire Caribbean. The InselAir Group currently accounts for a 62% share of current seat capacity at its original home market of Curacao and a leading 19% share in the more fragmented Aruba market, according to CAPA and OAG data. In much smaller Bonaire InselAir’s current capacity share is 56%. The group only has about an 8% share of seat capacity in Saint Maarten, but this will change once it turns its attention to establishing a third base (InselAir Saint Maarten is expected to be established once InselAir Aruba is fully up and running). Saint Maarten is another highly fragmented market with market leaders LIAT and Saint Maarten-based Winair accounting for only 15% capacity shares. Winair is already InselAir's only partner carrier from the Caribbean (the group also has three codeshare or interline partners from Europe and three from South America). The Caribbean remains a very challenging market but InselAir seems to have carved out a successful and growing niche. InselAir has clearly benefitted from consolidation and market rationalisation, positioning it strongly to pursue further expansion and continue its emergence as one of the leading airline groups in the Caribbean.